The atrium at Brevard College’s McLarty-Goodson Academic Building was packed with alumni and community friends as the college named the space after retired professors and major donors, Grace Jackson Munro Roy and the late Rev. C. Edward Roy. In their 76 combined years at BC, Grace and Ed Roy transformed lives through teaching, ministry, community involvement, and major commitments of their personal resources to scholarships. Grace Roy continues that tradition, regularly adding gifts to the several scholarships that she and her family support. There are five endowments at Brevard College that are affiliated with the Roys and their families, and Grace Roy has been instrumental in creating several others. In addition to the scholarships endowed by and for Grace and Ed Roy, Grace Roy also created in 2015 the Leadership Award in the Business and Organizational Leadership Program. This award recognizes an outstanding student in business each year at Honors and Awards Day. This past spring, Grace Roy was inducted into the Institute Circle of Lifetime Giving, a highlight of the annual Brevard Society Celebration. Ed Roy began his long tenure at the college in 1944, and ended with his retirement in 1984. He was the professor of religion, chair of the humanities division, chaplain, college marshal, and speaker at many of the required chapel programs in the early years at the college. He also served on the five-member committee that operated the college in 1968-69, after the death of President Emmet K. McLarty Jr., while the board of Trustees searched for a new president. Grace Roy taught at Brevard College for a total of 36 years, also arriving in the ‘40’s. 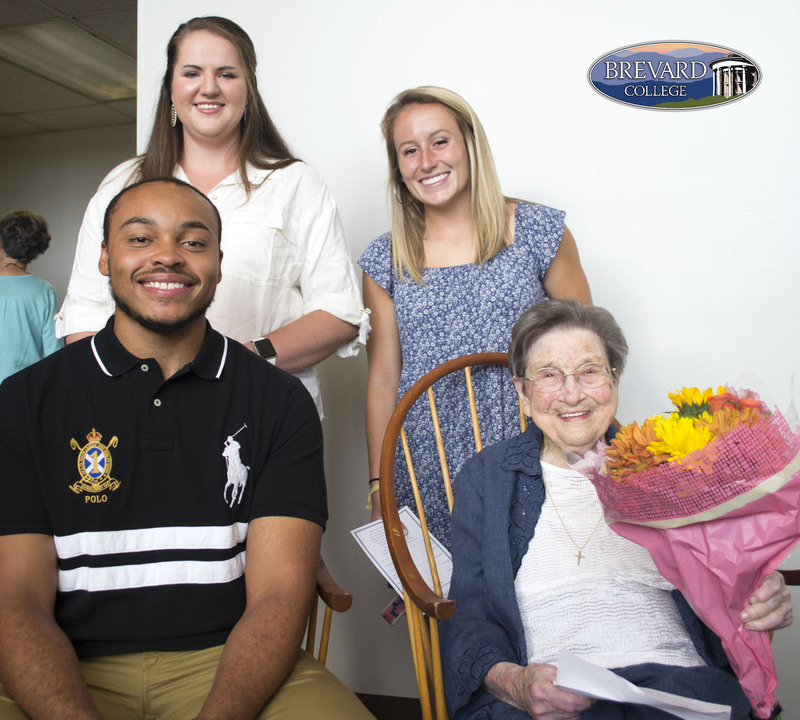 In 1940, Grace graduated from Winthrop College with a business education degree, and that fall, she began her teaching career in business education at Brevard College. She stayed until 1945, when she married the late Thomas F. Munro and left Brevard College. Grace returned to teach at Brevard College in 1956, where she remained for 31 more years until retirement in 1987. In 1994, Grace married Ed Roy and they remained a beloved pair on campus and in the community until Rev. Roy’s death in 2008. In honor and recognition of their dedication and contributions to Brevard College, the entrance to the newly renovated McLarty-Goodson Academic Building was named the Rev. C. Edward and Grace Jackson Munro Roy Atrium. A plaque and an accompanying biography of Grace and Ed Roy will be installed on the wall so that students and future faculty will all know about their commitment and generosity to the college. Photo cutline: Several of the students that receive the scholarships that Grace and her family support joined her to celebrate this special day. (left to right): Gabriel Covington, Kelsey Kushner, Megan Shina and Grace Roy. Brevard College is consistently recognized as a top liberal arts college. The College’s focus on experiential learning, and the campus’ location in the mountains of Western North Carolina makes it a top choice college for students around the world.